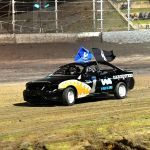 If you like your speedway on two wheels and without roll cages, a visit with the family to Perth Motorplex for this Saturday night’s Gold Cup Grand Final is essential with both Speedway Solos and the Flat Trackers set to wow fans. Among the Solos will be Daniel Winchester, and he is the man to beat right now. Winning the final race on Saturday would make it a Kwinana clean sweep for the season. Having ridden around Australia and the world, Winchester said Speedway Solos are unlike any other motorcycle to ride. Winchester rides a Stuha chassis powered by a 500cc four stroke GM engine. While the riding and tactics involved in a race are complex, the bike themselves are stripped to the minimum. 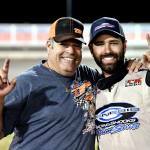 “We have no gears and no brakes, no rear suspension and very minimal front suspension,” Winchester said. For the West Australian rider, riding bikes at the speedway has been part of life since an early age. 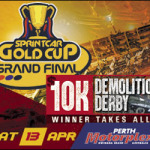 Fans at Perth Motorplex this Saturday can catch both the bike divisions plus the action of the demo derby at the end of the Gold Cup Grand Final. Also featured are the Maddington Toyota Sprintcar Series, Sims Metal Management Late Models, Pool Shop Group Speedcars and Telf Promotional Products Formula 500s.